Clients – Affordable Companion Care, Inc.
We provide assistance to people with short term or long term illnesses or illness recovery as well as seniors who no longer feel safe alone. We are able to help a wide variety of patients including stroke recovery, heart patients, surgical recovery, hospice patients, dementia patients to name just a few. Our attendants stay 24 hours a day, 7 days a week. Our attendants work for long periods at a time so the client does not have to cope with frequent changes of personnel. 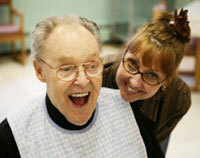 Our care gives the client’s family peace of mind so they know their loved one is safe.